Hi there. May I borrow eight seconds of your time? Great! Because that’s all it will take for you to become stuck on The Lunar Pilots. The Essex based, as producer Steve Orchard (Dire Straits, Chris Cornell and Noel Gallagher – to name a few) puts it, “New Retro” sound pours out over fifteen Alt-Rock tracks filled with depth and swagger while rocketing through the audible solar system on a wave of light and sound. Simply put, Point Of No Return feels like lying on the grass gazing at a light show dancing above your head on the backdrop of infinite vastness. 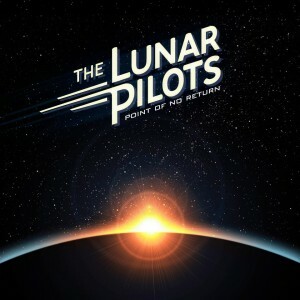 The album cover speaks volumes of The Lunar Pilots. I know, you aren’t supposed to judge a book by its cover, but there is definitely a dawning of a new day and the Pilots are, pun intended, at the controls. 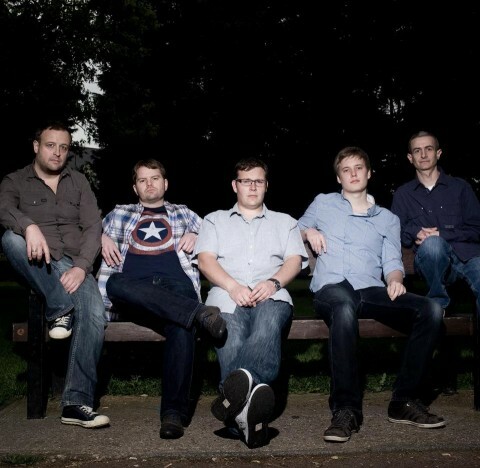 There are aspects still very, well, British evident in the sound – reminiscent of UnAmerican – finely crafted by Brien Edwards, David Elsworth, Keith High, Paul High and Conor Bailey. Though it is openly admitted that The Lunar Pilots are fans of Pink Floyd, The Killers and Radiohead, it is even more obvious that if all three were to get together and form some sort of musical off-spring, this would be it. The attitude of Flowers lingers on the keys of Wright while performing the “Lotus Flower” dance on grinding rock chords fused with electronic breaks. Before you go accusing me of musical blasphemy, remember that this is their debut LP; there is still a lot of growing to be done. But I’ll be damned if this isn’t a solid step into the light. With a release like this, the future is as open as the cosmos. Their Alt-Rock, even reaching into groove (“Pins And Needles”), sound echoes with slick licks and rolling melodies, but is not your little brother’s kind of rock. This is the kind of sound that echoes on festival stages in front of thousands of friends. Only so much credit can be given to producers and though they had a phenomenal man at the board, The Lunar Pilots deserve the applause and your ear. Boldly dynamic and devastatingly rock, these gents are going to go far. As long as they don’t let it go to their head, or sleep with each other’s significant other, this is a name we will be speaking of in casual conversation very soon. After all, who doesn’t like a British guy in a Captain America tee? The Lunar Pilots are a bit of the latter, which sounds a bit like a contradiction, I know. But when a band decides that they want to blend dream rock, prog rock, new wave, and indie rock, they better know their mixology. With the right mix, people are begging for more, get the mix wrong, and your audience is left with a bad taste in their mouth. It is like the fugu fish: there is a fine line between poison and tasty fish. Point of No Return offers up a lot of tasty fish. The opener, “High As the Stars,” opens all light and new wave but yields some great prog rock guitar riffs as well as some serious pop sensibility and vocalist Brien Edwards’ new retro vocals hammer home the stellar poetry. They match the momentum with the Paul High’s furious keyboards on “Hurry Up and Live.” “Hollow Tunes” has some great fills and riffs and a great solo from guitarist David Elsworth, while Keith High’s bass and Conor Bailey’s drums keep sharp time. While the blend of old an new are a clever one, the pacing is hard to keep. While the album crashes through the gate with the opening tracks, there are times that the songs limp along, only to gain momentum later on. The last three tracks carry the album across the finish line showing that the Lunar Pilots understand it is a marathon, not a sprint. I imagine with another few albums, this quintet from Essex will have it mastered and we will be talking about the Lunar Pilots for years to come. Head over to their bandcamp page and find out for yourself, and say you knew them way back when. Pilots, mixologists, fishmongers, whatever. Get on board with the Lunar Pilots. Please, for the love of God, do it before I make another pun. This entry was posted in Reviews and tagged album, Brien Edwards, British Rock, CD, Conor Bailey, David Elsworth, Essex, Keith High, LP, Lunar Pilots, music, Paul High, Pink Floyd, Point Of No Return, Radiohead, review, Steve Orchard, The Killers, The Lunar Pilots by Greg. Bookmark the permalink.